It occurred to me this week that I haven't said nearly enough about writers and writing on the blog. Perhaps that's because I find the how's and what's of the writing process a tricky thing to identify and nail down. How each one of us engages with this strange human act of trying to accurately convey our thoughts, feelings, beliefs and ideas with written language is as varied as our own backgrounds. That said, I've been stringing words together for almost as long as I've been alive, and there are a few things I've learned about the process. 1) It's much more than crafting words into paragraphs and paragraphs into pages. The writing process is akin to the birthing process. There are stages of conception, gestation and birth. As with actual pregnancy, writing must first be conceived then be given time to grow. That time of growth includes note-taking, outlining, having imaginary conversations with characters, cultivating ideas, mulling over theme, and more. Though there's often not much tangible output during the gestation phase, it must be considered as important as the actual writing. In fact, I consider that stage to be part of the writing process. Allow your creative writing the time and space it needs on the front end and you'll have a more fruitful writing experience overall. 2) The inner editor is the ultimate frenemy. Having a solid inner editor is hugely important for crafting a tight work, but if you can't turn that voice off while you're writing, your work's in danger. The editor should always be in service to the writer, not the other way around. That means, most importantly, when you're writing a first draft, don't re-read and tweak as you go along. Allow the work to be birthed in all of its messy glory before trying to fix it. Do your best to be a writer when you're writing and an editor when you're editing. 3) Everything has a beginning, middle, and end. We all know that stories have a beginning, middle and end, but so do chapters, paragraphs and sentences. When you keep this in mind at every stage of writing you can craft work that feels whole and solid to the readers. Rereading and editing with beginnings, middles and ends in mind also helps you identify where there may be holes or flaws in the work. 4) It will cause pain. There are many famous quotes about the pain of writing. 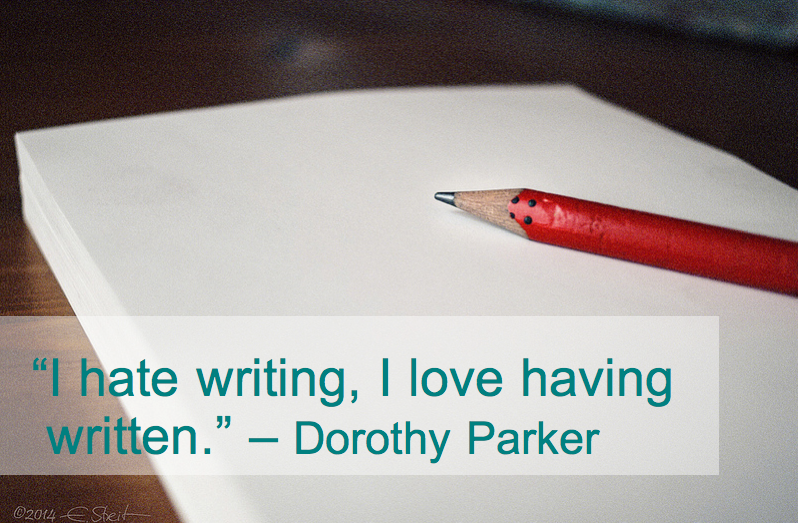 Dorothy Parker's is among my favorites, "I hate writing, I love having written." I don't know why writing can cause us so much pain at times, I just know that it does. The pain is not an indication of a person's ability as a writer. It's merely a by-product of the process. Don't let pain stop you if you have something to say. 5) Let it be bad when it's bad. We've all been there, that place where we reread what we've written and think, "God, that's bad." One of the worst things you can do as a writer is to allow bad writing to stop you in your tracks or derail your project. The more you do this the more you know that bad writing is inevitable. Since, as they say, "all writing is rewriting," there is no need to concern yourself with bad writing. Let it be. It will get weeded out later. For now, just be glad that you're savvy enough to know when something's bad. The real problem occurs when you don't. 6) Passion requires protection. Passion is the engine that drives good writing, whether it be passion for a particular subject matter, for the story or for the act of writing itself. When we spend too much time doing things like looking at industry statistics, studying a publishing model, comparing ourselves to others, trying to get more money, etc. we can cause our passion to dwindle. And when our passion starts to dwindle, we're on a slippery slope because this is hard work and, oftentimes, we're not getting compensated for it. What else do we have then but passion? So, do whatever you can to protect it even, and especially, if that means shutting the outside world out for periods of time. 7) Know the destination at the beginning of the journey. For those who want to make a living as a writer it's important to think about what that end game looks like. Do you want to be published in a literary magazine or have your trade paperbacks in bookstores? Do you want to be respected by a small niche of peers in your area of expertise or sell a million copies of an e-book? Probably it's a combination of many of those things. The trick is to have an idea of what you want going into to it. Why? Because writing is hard, time-consuming work and when you do it you actively disregard other things in life that you could be doing like, you know, crocheting, or cooking, or sleeping, or hanging out with friends. When you know the destination on the front end it will save you time and energy along the way and keep you focused on what projects, bodies of work, themes and opportunities are important. Simply put, the destination informs the journey. 8) Don't share until your ready. I never share a project when it's in the first draft phase. Ever. Feedback in the first draft stage can very easily derail a project since first drafts, by their very nature, need a lot of work. Do what you can to get the work to a solid point before sharing with others. Feedback should always only move you forward, never prevent you from moving ahead. 9) Share as much as you can. Once the work is ready, however, share it far and wide. The best way to revise and tighten your work is to find the commonality between the voices giving you feedback. The more voices you have, the better. Beyond that sharing oneself in this way is a brave thing to do, and bravery requires practice. Plus, you're writing this work for others to enjoy, aren't you? So don't be shy. Get it out there and let them enjoy it! 10) The more you write the less precious your work becomes. It's easy to get crushed when someone doesn't respond enthusiastically to something you've written, particularly when you don't have many works under your belt. When you write a lot and often each piece becomes slightly less precious. When the work is beloved but not precious it's easier to look at it more objectively. 11) Not everything is meant to live on and on. This goes hand in hand with #10. The more you write the more you realize (usually in hindsight) that some works are practice works, some are writing samples, and others, if we're lucky, are meant to live on as published works. It takes time and space to fully realize a work's destiny, but the more you do it the more you'll make peace with the fact that some of your babies were born only for your own pleasure and enjoyment. Embrace this fact and keep on writing.